How do we praise God? Listen to this tremendous lesson to learn that we can only praise God when we acknowledge He is the sovereign Creator and have an understanding of His essential nature. See that praise is not just repeating words like “hallelujah” and “praise God”, but an understanding of what He has done, is doing, and will do in our lives. Be challenged to immerse yourself in the Word of God so you can learn to praise Him accurately and continually. 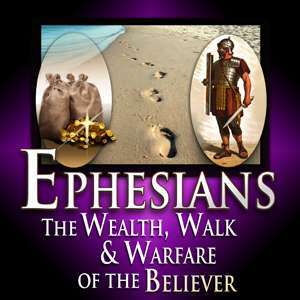 Note that the title on the video should say Ephesians #21. Have you been adopted? Listen to this lesson to learn that when a person believes in Christ as their Savior they are adopted as a son by Jesus Christ. Find out the incredible benefits given to you, including an inheritance and becoming a member of the Royal Family. Understand the difference between being an heir of God and a co-heir with Christ. See that you not only receive many blessings, but you are given the responsibility to grow to spiritual maturity, which is accomplished by learning the Word of God and walking by means of the Holy Spirit.